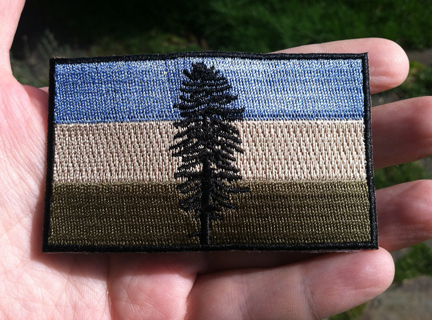 New Muted Cascadia Patches are now available! now available at http://foomart.com for $3.00 each or four patches for $10.00. All orders come with free 1st class shipping within the United States. Patches come with iron-on backing, but it’s recommended that you sew the patch on as well. The Muted Cascadia patches were designed by user binkitt over on the http://reddit.com/r/cascadia subreddit, so all thanks go to him for spearheading this project. Why do you need a Military Patch for do you have a Militia that would need it. I don’t care if you do. I think it would be cool if you did. A militia would cost a lot less then a standing army and would be able to do the same without the millions and millions that it would cost to keep a army going. But without a military force you are asking to be taken over at any time. Just my 2 cents Thank you. The two muted flag patches I’ve seen for camouflage uniforms are ones for the American and German Flags. Both of these rely on shades of greys browns or greens replacing the flag colors totally. A future suggestion for a Muted Doug patch might be to replace the colors (the blue is what I’m actually criticizing) in a like fashion. I am wearing my Cascadia patch proudly as I serve in Afghanistan! Thank you!